The post has been shared on Facebook by multimedia journalist GMB Akash. NEW DELHI: There's no saying what lengths a parent would go to bring their children happiness. A story of one such dad is touching a chord with several on Facebook. A post shared by multimedia journalist GMB Akash highlights the story of a dad and his unconditional love for his children. 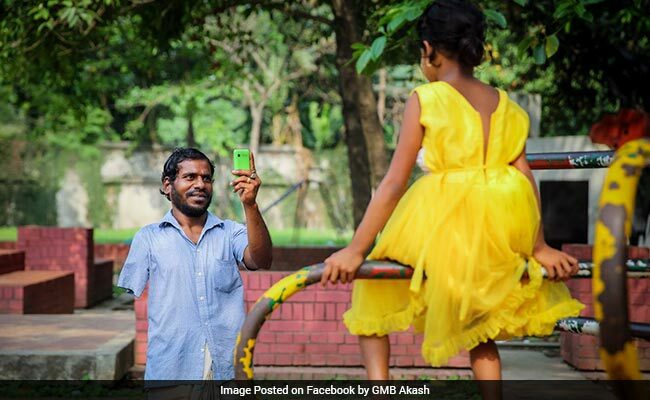 It takes everyone through the journey of MD Kawsar Hossain, a father who bought his daughter a new dress after two years. Shared on April 5, the post has collected over 45,000 reactions and more than 11,000 shares on Facebook. Mr Hossain begins by talking about his experience of buying his daughter the dress. "While I handed sixty pieces of five taka note to the seller, he yelled at me by asking if I am a beggar. My daughter held my hand and cried to leave the shop by saying that she did not want to buy any dress. I wept (sic) off her tears with one hand. Yes, I am a beggar," he says in the post. Mr Hossain explains that he lost his arm in an accident. "Ten years ago I had never thought in my nightmares that I have to live by begging from people," he says, adding that his daughter Sumaiya feeds him every day "by saying she knows how difficult it is to do all work with one hand." She even stays by his side when he's on the streets. "I feel shame while she looks at me when I lend my one hand to others. But she never leaves me alone," he says. And this day, when he bought his daughter a dress, is one of those days. "After two years my daughter is wearing a new dress, that's why today I brought her with me to play for some time," he says. "Today this father is not a beggar. Today this father is a king and here is his princess," he says. "Bow to this king," says one commenter on the post. Several others have even asked if they can help him in any way. What do you have to say about this dad? Tell us using the comments section below.